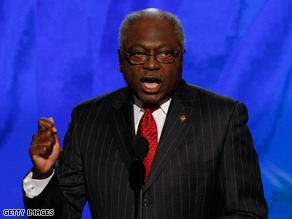 Clyburn said the choice of Palin is risky. (CNN) - A leading House Democrat said Friday John McCain's choice of Alaska Gov. Sarah Palin is a "risky" move that could ultimately prove disastrous to the Republican prospects in November. Meanwhile, a top Senate Democrat said the pick is a "Hail Mary pass" and a "roll of the dice," in what is the initial reactions from McCain's rival party. Speaking to South Carolina ETV Radio, House Majority Whip Jim Clyburn likened the choice of Palin to Walter Mondale's choice of Geraldine Ferraro in 1984 and George H.W. Bush's pick of Dan Quayle in 1988. Both picks - relatively unknown political figures at the time - generated initial excitement but were ultimately deemed poor choices by many political observers. "I think (her selection) would be something similar to Dan Quayle - Dan Quayle proved to be sort of an embarrassment as a campaigner, being thrust on a national stage like that could be very tough," Clyburn said. "Now Mondale tried to shake things up by going with Geraldine Ferraro, she proved to be a disaster as a running mate. And as a campaigner, she was absolutely awful." "And so I just think that it is very risky for McCain to do this, but it may be all he has left," Clyburn also said. In an issued statement, Sen. Chuck Schumer said Palin is significantly mismatched to Democratic VP candidate Joe Biden and said the prospect of her becoming president is "troubling." The Obama campaign also told CNN Friday the choice of Palin takes the question of experience "off the table." "Experience is being taken off the table considering you're putting someone within a heartbeat of the presidency with the thinnest foreign policy experience in history," spokesman Bill Burton said. Update: Rep. Rahm Emanuel, the 4th ranking House Democrat, said in a statement the choice of Palin "shows political panic." "Is this really who the Republican Party wants to be one heartbeat away from the Presidency? Given Sarah Palin's lack of experience on every front and on nearly every issue, this Vice Presidential pick doesn't show judgment: it shows political panic," he said. McCain. My day has been made AGAIN!! This is a trick for media attention. All the RNC trying to do is stir up hate, division and confusion between two historic groups ( African Americans and Women). Republicans are doomed! He selected her to throw off the "Working Women/Mother issues that Michelle Obama has Mastered. He needs to show small kids on stage, since his own grandkids from his first marriage will probably not be there. He needs to figure out how to connect with Women, besides his obvious votes against their issues for 26 years. McCain is a decietful, ill tempered, washed up soilder, who should not be President. McCain has not made history naming her as a VP. Geraldine Ferraro was the first female VP candidate. They also lost the election. She has more executive experience than Obama. McCain, Biden and Palin are more qualified than Obama. Obama is the affirmative action candidate. Oh no, John...what were you thinking? With all the highly skilled, seasoned and EXPERIENCED legislators to choose from in our party, why on earth would you fold your hand with this draw? Oh my....you've lost my trust in your leadership and ultimately my vote. What about the fact that she is under investigation in her own state. Quite an accomplishment for a governor of 2 years. Typical McCain stunt. Wait and see/then react. Obama is miles ahead of this old man who is out of touch with everything (even the number of houses he owns) except the republican right wing and the rich old boys who are afraid of watching the power they have always had dissipate. The Obama Freight Train is about to de-rail the straight talk express. What history is she making? Geraldine Ferraro beat her by a couple of decades. That's the Repugnants for ya. On the cusp of change! LOL! They always say that your choice in your VP tells what kind of President you will make. Senator McCain made a really risky choice. I hope that the American people are really paying attention to this. Our country is in trouble and we need two people in charge that will be ready on day one.